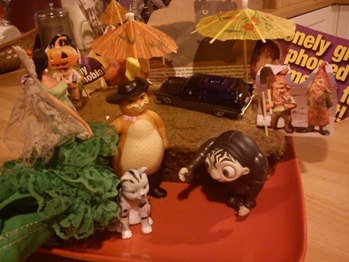 Halloween is a great time to eat some really wacky food. 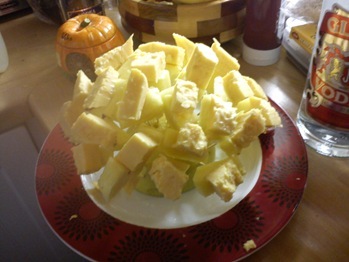 At my friend P’s fancy dress party at the weekend, the food did a bit of dressing up too. 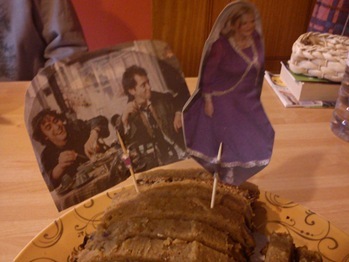 Her second sliced cake was adorned with pictures of Anne Widdecombe, plus Withnail and I. And why not? Remember the scene in the film where Withnail and I demand ‘the finest wines and cakes known to humanity’? 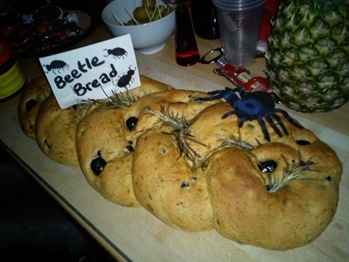 J and M made this absolutely sensational loaf of beetle bread, where black olives nestling in the dough pretended to be cockroaches. Insects never tasted so delicious! 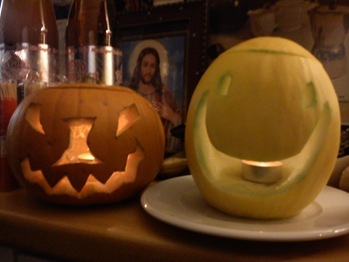 I almost prefer the honeydew melon lantern – happy smiling ghoul! Guests really went to town on their outfits, too. R dressed as a Victorian wolf-woman, P was a ghoulish pagan dandy, S was a pale-skinned vampire, I met a young Ziggy Stardust, my husband was a serial murderer complete in blood-soaked body bag, and I dressed as a 1980’s aerobics instructor knifed to death in the New York subway. A number of people wore very disturbing masks. And actor Willem Dafoe made a surprise appearance, in the form of an extraordinary art installation. All as it should be! I have now almost got the fake blood stains out of my skin and hair…thanks P for an unforgettable night! 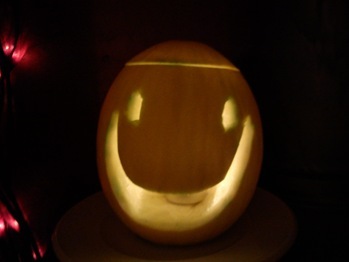 Bless that melon! I wish it was my friend, like the basketball in Castaway.